I thought I'd take a few minutes out from talking about boxing news and results and see what games are out there. Football fans get to play out their favourite sport on their consoles with Fifa, Pro Evo and a whole load more football titles, but boxing games seem to be pretty thin on the ground. Traditionally there have been some good boxing games released on the PS1, PS2, Snes, Genesis and any other console you can name. You'll probably smile when I write titles such as Ready to Rumble, Knockout Kings and Mike Tyson's Punchout!. Those days are gone, I'm afraid, and we are left with a barren wasteland. At the minute, the newest boxing game released on a console is EA's Fight Night Champion, and that was released in March 2011. Despite it's relative old age (in the gaming industry twenty months is a long time) Fight Night Champion holds the #1 spot in terms of graphics, game play, control and overall ability to put the feel of the sport in game form. With no sequel planned in the near future and no decent rivals, Fight Night Champion is the best boxing game to buy on your console. Does the lack of current boxing games being released and developed mean that boxing is less popular? I don't think so. I just think that games development is so expensive now that publishers won't even consider putting out a game unless there is a massive audience ready and waiting. you just have to look at the amount of sequels being released to see that - as I speak the gaming world is waiting on Assassin's Creed III and GTA 5 to be released. The PC has more titles available and many of them for free, although they are mainly indie and mini games that don't offer much in the way of graphics, playability or indeed fun. Most of them feature poor animation and really aren't worth wasting your time on. That's kind of why I wrote this post, to warn you away from the tons of crap out there. If you really insist, you can find some boxing minigames by doing a quick google search. 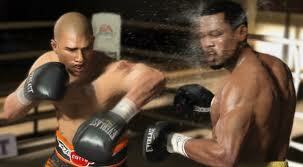 If you want something decent to play, go on Amazon and buy Fight Night for your PS3 or Xbox. If you want I'll even give you a game on it, although don't pick Mike Tyson. Everyone does that. Need the latest boxing news?